New school year and annual eye exam go hand in hand. Most children will have their eyes on the blackboard when school starts but they might have a tough time seeing it. A survey from the Canadian Association of Optometrists says fewer than 25% of Alberta parents make eye health one of their top three health priorities. As Kevin Flemming reports, an eye exam can make a big difference in a child’s life. Coreen Grant (mom): What does this say? Kevin Fleming: At five years old, Ashton Grant is starting grade 1 and learning to read. He’s mostly excited about lunch, recess, and seeing his friends. Ashton : Ms. Simmerman was in Kindergarten now I am going to have her again, and Liam is, but Kaiden isn’t. He’s in a different class. Dr. Farah Lakhani: Have you noticed any head turn, eye turn, eye squint? Anything that you’re concerned about mom? Kevin: This isn’t Ashton’s first eye exam. His mom knows the importance of having her son’s vision checked. Coreen: I also have a nephew who when he was three, he got glasses and he was a really strong plus prescription, and it was a whole new world for him, so I have seen how much of a difference it makes. Dr. Farah Lakhani: Can you read it backwards? Kevin: Dr. Farah Lakhani says the majority of parents don’t bring their children in to have an eye exam. Dr. Farah Lakhani: And what’s this one? Kevin: That’s resulting in 1 in 4 school age kids having a vision problem. 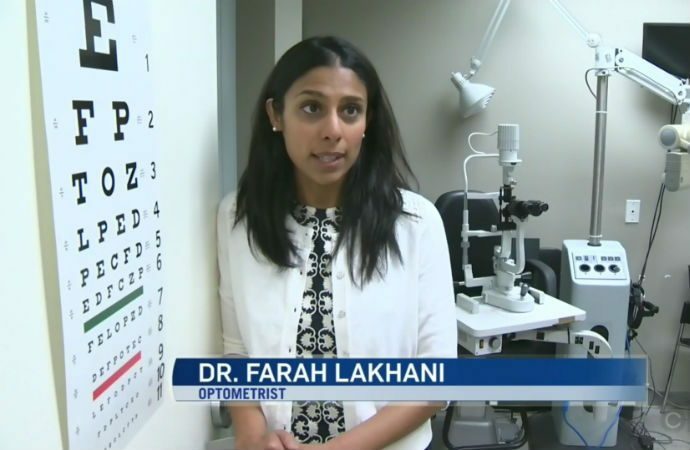 Dr. Farah Lakhani: Let’s take a look at the health of the eyes under the microscope. Dr. Farah Lakhani: Parents don’t know that their child isn’t seeing quite the way they should be and children don’t know and this can affect their learning, their development, and they can’t grow and excel to their full potential. Dr. Farah Lakhani: His vision is actually quite good far away. Kevin: Turns out Ashton’s eyesight won’t cause him any problems on his first day of school. Dr. Lakhani says she sees an immediate difference in children once they’re diagnosed. Dr. Farah Lakhani: There’s a little poster outside in our office and a child had put on glasses for the first time and she was like “Oh it’s a cat!”. She thought it was a raccoon I guess the whole time and it was just amazing to see that. It kind of melts your heart. Kevin: Kevin Fleming, CTV news, Calgary. Click here to book an appointment for your child with one of our Optometrists.